When Porsche confirmed that the 2018 911 GT3 will indeed come with a manual gearbox, we were all very excited about a car that most of us can’t afford. The only problem is that Porsche is going to charge you the GT3 premium for what should be the cheaper gearbox. 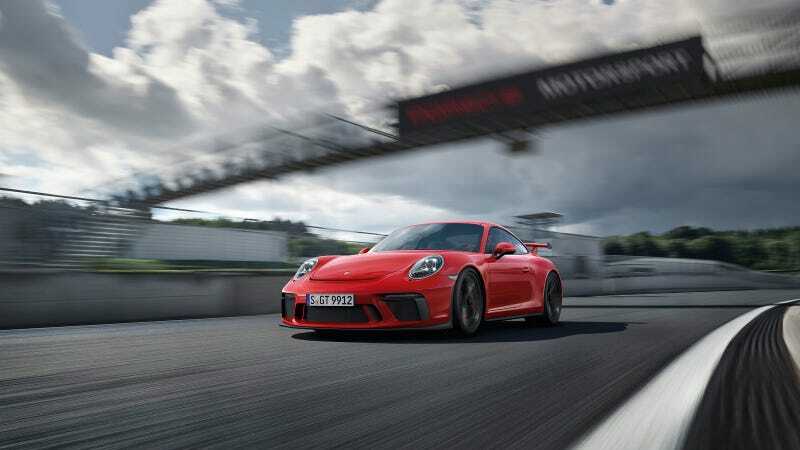 Several outlets, including Car and Driver, got all pumped up when Porsche said that the manual transmission will be a “no cost” option on the next GT3. The thing is, on all Porsche 911s that have three pedals, the manual has always been a “no cost” option—the base price. It’s the automatic PDK that will run you an extra $3,250. That makes perfect sense, as relatively low-tech and old-school manual transmissions are typically much cheaper to produce, especially compared to the excellent engineering that goes into Porsche’s PDK. For example, a base 911 Carrera has a starting price of $89,400. If you choose the PDK, the price goes up. In regards to the GT3, what Porsche is saying is the base price will not change regardless of the transmission you choose. However, given that the current MSRP of the GT3 is $144,650 already includes the cost of the PDK, if you want a stick you will have to pay that PDK premium anyway. If Porsche was really not charging you extra for the three-pedal option, then it would do what it does on all other manual 911s: the base price of the next GT3 would be reduced by $3,250 for the manual and held at the same $144,650 for the PDK. Now you could make the argument that the six-speed manual does cost Porsche some money because it’s different than the seven-speed stick found in the rest of the 911 range. However! The six-speed was already developed for the 911 R, and is rumored to replace the seven-speed manual in the next generation 911. You’d think that production costs have already been absorbed, and that Porsche doesn’t need to effectively charge $3250 to make a profit. As an aside, I would also like to point out that the manual option is strangely absent from the current configurator for the all-new GT3. However, Porsche’s website seems to have a glitch right now that only allows you to either build a GT3 or 911 R and no other 911, so I’ll assume that Porsche is working out some bugs. At the end of the day, the type of buyer who is dropping over $140,000 on a 911 isn’t going to split hairs over a few grand. They’ll probably even recoup that investment by a much larger margin when it comes to resale value, but the fact remains that manual GT3 should be cheaper than the PDK version.